Cape Canaveral and Kennedy Space Center are both at pretty much the same location in Florida. I do not understand why they are referenced separately in media. How much are they separate entities? Is there any significant difference between the two? For example, are launches from each subject to different regulations for the launch provider? Some of the confusion arises because there is also a geographic feature named Cape Canaveral. It's pretty much the green area shown in the other answer, east of the Banana River. On this geographic feature Cape Canaveral is built Cape Canaveral Air Force Station. Today's Kennedy Space Center (KSC) is built on Merritt Island. 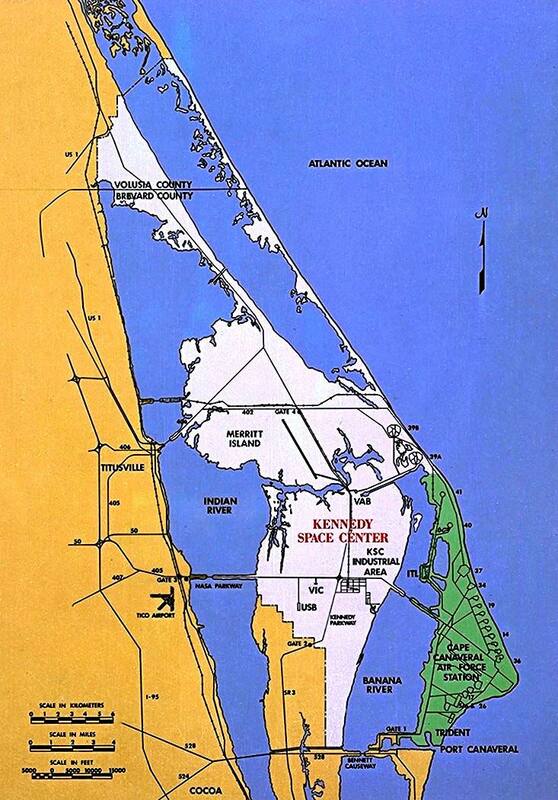 Even more confusingly, in 1963 then-President Johnson named the geographic feature Cape Kennedy and the NASA site after President John Kennedy. (At the time what we now know as KSC was called the Launch Operations Center.) After the renaming we had Kennedy Space Center (not located on Cape Kennedy, but on Merritt Island) and Cape Canaveral Air Force Station (located on Cape Kennedy). This drove the locals crazy, and in 1973 the state of Florida renamed the geographic feature Cape Canaveral, leading to the current situation. Need more? There is a town named Merritt Island and a town named Cape Canaveral! Fortunately, these are located on the appropriately named geographic features. Today there is no such place as Cape Kennedy! Be in the cool kids club by never saying that phrase. Cape Canaveral is composed of two items, the Kennedy Space Center, run by NASA, and the Cape Canaveral Air Force Base, run by the Air Force. Because they are two very different organizations, the rules are quite different for each. See this map from Wikipedia to show the different locations. Note that Kennedy (NASA) owns launch pad 39a and b, while the rest of the launch pads are owned by the Air Force in Canaveral. Not the answer you're looking for? Browse other questions tagged history kennedy-space-center cape-canaveral or ask your own question. How far is Cape Canaveral from Kennedy Space Center, administratively and programmatically? How much water is used at the Kennedy Space Center (KSC)? Why is the American space program launch site based in Florida and not Texas? What do these GPS-related emblems represent? Does one of them show “Marvin the Martian”?